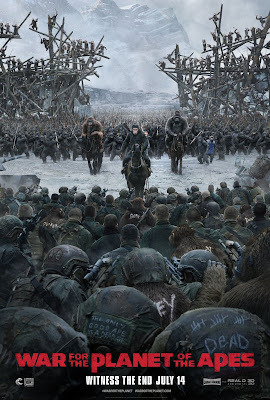 Since its inception in 1968 Fox’s Planet of the Apes franchise, based on Pierre Boulle’s novel, has represented the best in mainstream science fiction cinema, projecting engrossing, smart allegories against a broadly fun and thrilling backdrop. Eerily tapping into the zeitgeist of the day almost every time out, these pictures have become an unlikely success story; a reliable earner that consistently deprives viewers of happy endings or easy answers. 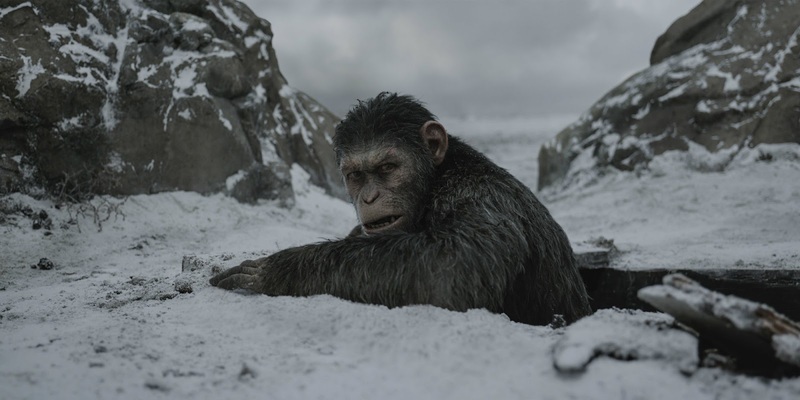 This proud tradition evolved beautifully over the past few years with Rupert Wyatt’s Rise of the Planet of the Apes and Matt Reeves’s Dawn of the Planet of the Apes, which married the series’ bleak and daring integrity with state-of-the-art WETA wizardry to awesome results. And, in the latter film’s crushing ending, the ground was laid for an unforgettable conclusion to the arc of Andy Serkis’ chimpanzee revolutionary Caesar. It’s beyond satisfying to report trilogy capper War for the Planet of the Apes is a towering achievement; a haunting and challenging final chapter that’s as impressive as its predecessors. Easily the most despairing entry yet, it’s something of a miracle it even exists in an age of obsessive market-testing. But, under the confident watch of remarkable director Matt Reeves (who also shares scripting duties with Mark Bomback), the descent into misery is earned and thematically appropriate, propelled by the wounded souls of the characters, not mean-spirted nihilistic manipulation. A self-professed student of Hitchcock, he implicitly understands the importance of subjectivity and offers each crucial participant an opportunity to express their own invaluable point-of-view. 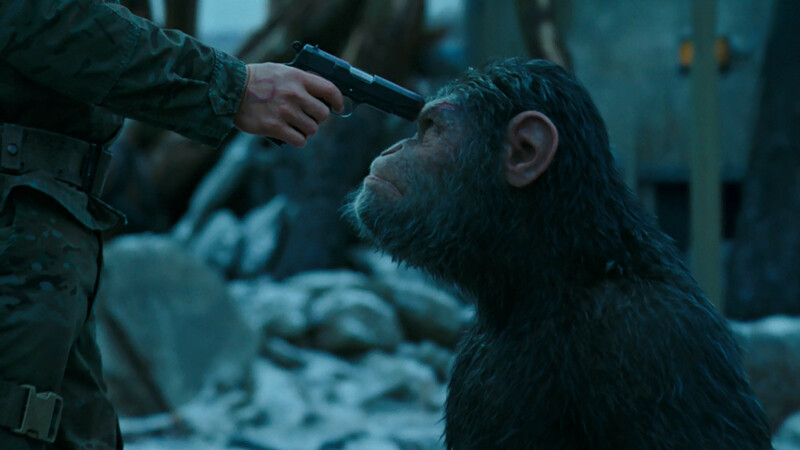 What Reeves has fashioned with his second Apes picture is an honest examination of war. He has little interest in cranking out splashy, sensationalized action spectacle devoid of consequences. No, instead he’s fascinated in exploring the dehumanizing effects and psychological cost of battle. Much like in 2014’s Dawn, the grandly conceived mayhem is ugly and unpleasant, committed by desperate men weakened by fear. This approach to the violence is the correct one. It intensifies our sympathetic bond with tormented protagonist Caesar, whose yearnings for peace and community mirror our own. War kicks off in bravura style, with a tension-soaked, largely dialogue-free sequence wherein a small militia force attacks an ape encampment in the deep forest. This conflict, which results in untold casualties, ultimately draws Caeser back out of the shadows. Despite proposing an honorable ceasefire, his dreams are unspeakably shattered when the ruthless Colonel (Woody Harrelson, appropriately Kurtz-ian) leads a stealth assault unit right into the heart of his hidden home fortress. Racked with fury, and still harboring guilt from killing former friend Koba (Toby Kebbell), our hero, along with loyal lieutenants Maurice (Karin Konoval), Rocket (Terry Notary) and Luca (Michael Adamthwaite), embark on a quest for vengeance against their deranged enemy. However, the mission proves far more fraught with complication than anticipated, as staggering revelations regarding the world, and the apes’ place in it, come to nightmarish light. All too often creative fatigue sets in by the third franchise instalment. Not the case here! 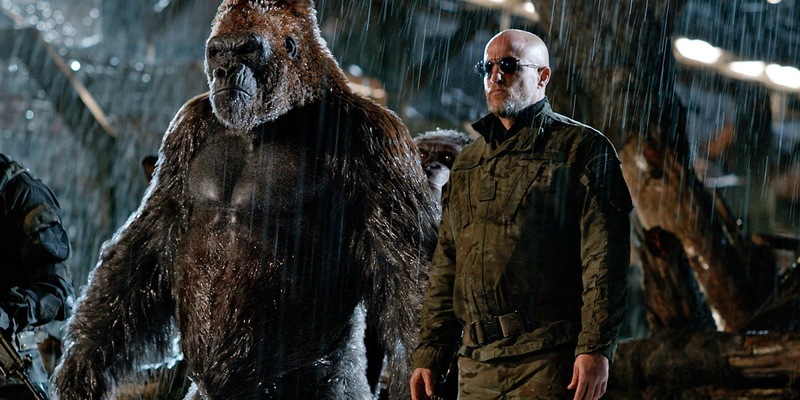 Continuing to expand the Apes universe in bold directions, Reeves early on employs a basic road trip structure as a means of introducing fascinating new characters and concepts. Most compelling, and likely crowd-pleasing, among War’s additions is Steve Zahn’s Bad Ape, a meagre, Gollum-like figure who has long survived as a lowly scavenger. Supplying the film’s only real comedy relief, there’s nonetheless a tangible sense of melancholy to his goofiness; the wacky eccentricities born primarily from past pain and isolation. He offers a fresh perspective on the long-raging struggle, as does a young mute girl (Amiah Miller) fatefully brought into Caesar’s circle. She adds unexpected poignancy and grace to some of the movie’s most seemingly hopeless moments. These two forces of warmth and decency are balanced out by the problematic Rex (Ty Olsson), the fearsome gorilla who leads the Colonel’s Donkey division - a platoon of human-collaborating apes who’ve accepted slavery in exchange for self-preservation. 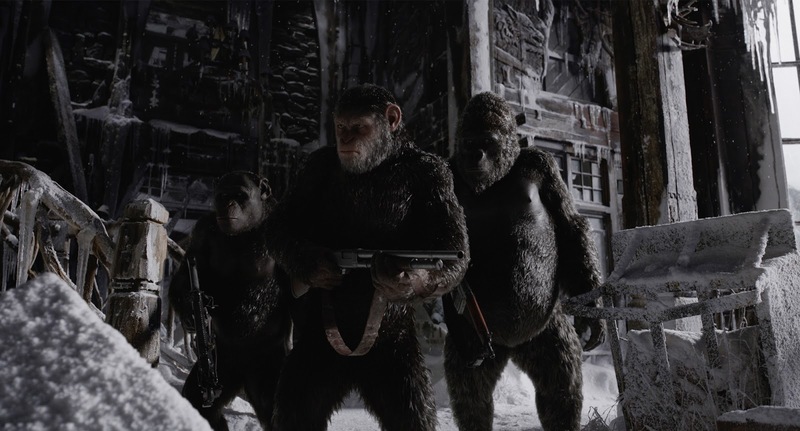 Reeves’ and Bomback’s screenplay smartly uses this tragic villain (a welcome follow-up to Dawn’s Koba), and his self-loathing simian allies, as a means of blurring the battle-lines and deepening the film’s remarkable moral complexities. By fleshing out his internal struggles, and those of the fallible members of Caeser’s own army, the picture paints a sadly relevant portrait of the corrupting power of terror. In Caesar, these modern Apes tales have fashioned one of the most captivating blockbuster protagonists in recent memory. While savior figures often come across as impenetrable and difficult to relate to (especially when presented, as here, with heavy biblical overtones), his tormented, doubt-filled journey has proven consistently compelling. In War we see him in his rawest state yet, nearly broken by the burden of leadership and unsure of both himself and the future of his species. There’s frankly no better word to describe Serkis’ performance than magnificent. Despite acting through layers of incredible technology he once again imbues his masterpiece creation with stunning emotional sophistication and touching compassion. His noble chimp visionary - far and away the franchise’s greatest protagonist (sorry Chuck!) - faces insurmountable hardships and stumbles, and we’re right there with him for every grueling, uneasy step. What a wonderful unexpected gift this new series has proven to be. To see a studio plunge ungodly resources into rebooting such a strange, downbeat property, and then show a steadfast commitment to artistry, innovation and well-crafted storytelling over easy money, is such a stunning rarity it warrants respectful appreciation. And it is undeniably exhilarating to see their hard work pay off! The commanding War triumphantly solidifies the Caesar saga’s rightful place, alongside the Lord of the Rings and Dark Knight pictures, as the one of the very finest contemporary epic trilogies. “Apes together strong,” indeed. I have heard so much about the planet of apes trilogy but somehow never got around to watching it. Reading your post I think maybe I should. I am really glad to read I am really glad to read it and being able to share my thoughts on it.